"Don't Let Yesterday Take Up Too Much Of Today!" Consistent, Repeatable Color and Quality. We employ proprietary and industry standard Quality Control Process to ensure the best in consistency and repeatability that is available in the market. One of the reasons that WTP! is so late at getting into the gang run offerings was figuring out how we could embrace the opportunities to put multiple jobs on a form without sacrificing quality. Today, we are proud to announce that we have done that by using some of the methods that you can read more about on our sustainability page. Expertise and Service that is second to none! When you call WTP! you speak to a person who has many years of print experience and many more years of experience in the shop that they can get answers from to help you with your most complex project. Even our accounting department is staffed by people with printing background. If we can’t help you – no one can! One business! One name! One focus! Our entire business is based on our belief that brokering print will continue to grow and is becoming the most popular way for end users to purchase their printing needs. We understand your business like no one else and as such, we are not going to compete with you under this name or any other. We are here for one reason – to support the segment of printing that we all know as “Print Brokering”. Whether it is the core of your business, a small part of your business, or maybe as a printer, you might need a backup or a 40 inch press that you can TRUST – WTP! is your solution! WTP is dedicated to your success 100%. WTP will work directly with you to develop custom programs designed to meet your specific needs where required. We are big enough to deliver the most complex project, but we are small enough to work closely with you and your team to provide solutions. Strong! Flexible! Motivated! For a consultation/questions please CALL US! 1-800-372-7319 or Email Us! 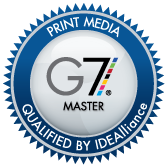 G7 Certified in Color Contract Proofing, Electrophotographic – Dry Ink (Toner) and Offset - Commercial Sheetfed Productionl Western Trade Printing is California’s only printer certified in all three of these categories! One of only 20 in the USA! That is to say that when you use WTP, you are working with a printer that is going to deliver accurate and consistent color, while minimizing waste throughout the printing process from proof to delivery. To learn more about G7and what it means to you and your customers. WTP! has obtained certification in accordance with the Forest Stewardship Council® (FSC®) Chain of Custody Standards. The Forest Stewardship Council (FSC) is a nongovernmental, non-profit organization that promotes the responsible management of the world's forests. By adhering to practices listed in our FSC certification, we are a vital link in a "chain of custody" which ensures that forest products (in our case, paper) can be traced from their final manufactured product all the way back to the well-managed forests from which the raw materials were harvested. We invite you to discover how WTP! 's certified green, lean & clean services can help bring sustainability and value to your printing today! WTP! uses soy and other vegetable-based inks that are Made in the USA and are less harmful to the environment than their petroleum-based counterparts. Soy and vegetable products are used in ink for their oils, which act as the vehicle for the ink pigments. There are several types of vegetable-based printing inks, including linseed (Flax), tung (Chinawood), castor, canola, and safflower. Soy is popular because it is a very stable material that exhibits excellent "wetting" properties which enhance its ability to carry solid pigments. Most manufacturers of soy and vegetable based inks today actually "blend" ingredients, much in the way a winemaker will blend grapes, in order to take advantage of the unique characteristics of each oil. All of our papers and synthetics are recyclable and you can freely print the recyclable logo on your printed projects. WTP! has partnered with domestic suppliers for our core house coated papers and they are s Made in USA! It is an FSC Certified sheet that is responsibly manufactured to exceed all FSC and USA regulations. It is a higher quality sheet than most of the imported sheets that are being used today. We also provide a wide range of premium and recycled sheets for your high end custom projects. Western Trade Printing works Day and Night to deliver full-service, high-quality printing that consistently exceeds our customer’s expectations in today’s deadline-driven environment. Western Trade Printing is a fully-equipped trade printer and known for exceptional customer service, expertise and value. In today’s highly competitive market, we practice mandatory measures to ensure that your work is never compromised and is produced using the latest environmentally responsible methods. From Customer Service through Full Service Bindery, we take pride in our team and their combined industry experience. Drilling, Shrink Wrapping, Paper Banding, Round Cornering, Hand Stitching and MORE!